Ya Jagoff!!! | Thanks To All Of You - The Readers! Home Blog Updates Thanks To All Of You – The Readers! 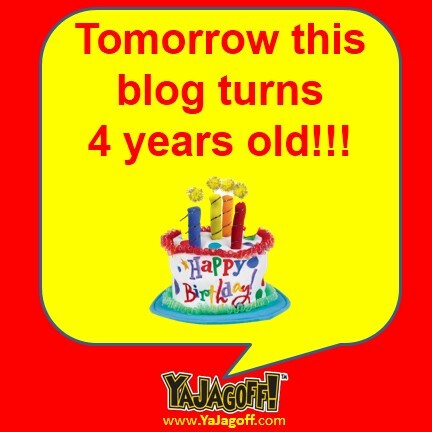 We’re 4!!! And the good news we STILL act our age! Tomorrow, the anniversary of the 2011 NHL Winter Classic in Pittsburgh, is also the anniversary of this blog. Mother Nature, who chose to let it be warm and rain on the game between the Penguins and Capitals was our first Jagoff post! This year we added the Yakkin’ With Ya Jagoff video episodes to the blog. The short interviews of interesting Pittsburghers get posted every Wednesday. The very first episode, with TC everyone’s favorite beer vendor, is below. If you haven’t seen all of the “Yakkin’ With Ya Jagoff!” video interviews of Pittsburgh personalities, click HERE to get to the Ya Jagoff YouTube Channel! It’s been fun doing this and it wouldn’t be fun if it wasn’t for all of you. Thanks so much to all of you who read this silly stuff and a special thanks to those of you who SHARE it with others. If you have one resolution, maybe it could be to invite 1 more new friend or family member to the blog? That is, if you’re not proposing to lose weight, save more money or stop smoking.